Sincere thanks to the many who left congratulatory comments on a solid year of educational blog posts. Your kind words were and are greatly appreciated. 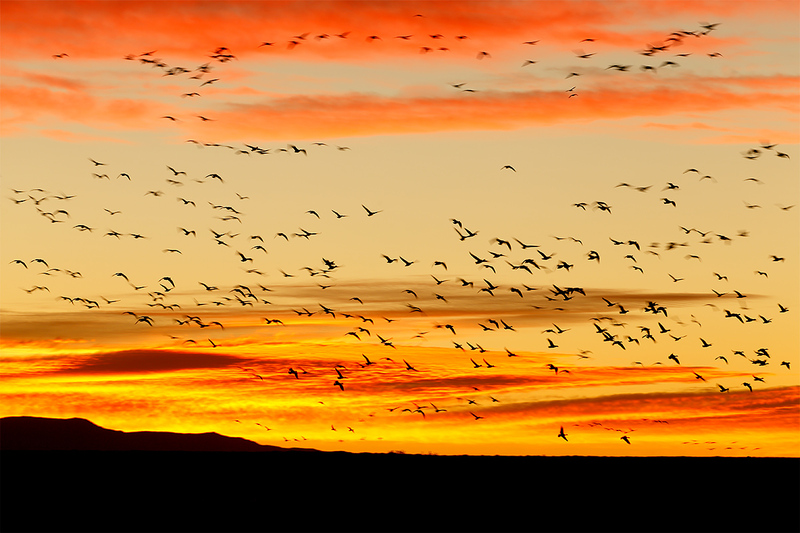 On Sunday, the morning of first full day of the 4-Day Bosque IPT, we lucked out with a killer sunrise–an eight out of ten for Bosque–with big flocks of geese flying back and forth through the color for more than fifteen minutes. We did well for the rest of the day and everyone learned a ton. This blog post was published from my hotel room in Socorro, NM at 4:00am. This image was created at 6:36am on the morning of Sunday, November 30, 2014, the first full day of this year’s 4-Day Bosque IPT. I used the Gitzo 3532 LS carbon fiber tripod), the Mongoose M3.6 head, the Canon EF 200-400mm f/4L IS USM lens with Internal 1.4x Extender (at 200mm), and the Canon EOS-1D X. ISO 100. Evaluative metering 1 stop as framed: 1/30 sec. at f/6.3 in Tv mode. Central Sensor Surround/Rear Focus AF as framed. Click here to see the latest version of the Rear Focus Tutorial. Click on the image to see a larger version. I’ve been here for more than two weeks, during this, my 20th consecutive Thanksgiving at the refuge. As always, things are different. And as always, whatever the conditions, Bosque can be wondrously inspiring and exciting at any given moment. The early morning fly-ins and blast offs have been both dependable and spectacular; if you are lucky enough to have some thin clouds in the east at 6:30am, you will be blessed with some of the best opportunities that you might ever have imagined. With the total corn crop at zero this year–the refuge has been unable to attract the best farmers since they were screwed by the Feds and the Rio Grande Silvery Minnow –during a severe drought, the movement of the large flocks around the refuge during the daylight hours has been hit or miss at best. Daytime goose blast-off opportunities have been virtually absent for the past ten days. Management has however done some neat stuff by moving water around creatively. This and that field have alternately flooded and drained. This has provided some excellent duck and blackbird blastoff opps, and earlier on, some good Snow Goose blasts as well. Neither crane pool was plowed because the mud created by unexpected late summer rains made it impossible to get bulldozers and other heavy machinery safely into them. Harry’s Crane Pool is pretty much an overgrown mess. The Ed Kranepool is in much better shape but for reasons unknown to me, the birds are staying well back in the pools. The temporary tour loop road, opened only briefly this past weekend was hit or mostly miss. Why is it open only three weekends each year? Why must you stay in your vehicles on the south to north and north to south legs? I was told last year by a higher up in the refuge management team that the “Remain in your vehicle” signs would be removed. They were not. On the subject of questions, why was the fence in front of the refuge HQ removed? It was a good spot to photograph crows and ravens in early morning light? Why has the pond just west of the March Deck been kept dry for the past several years. It was a great spot to photograph pintails in sweet afternoon light from your vehicle. And here is a neat Bosque story. For as long as I can remember there were lots of young willows lining the banks of the irrigation ditch between the Willow and Coyote Decks. And there was always a viewing window a bit closer to the Coyote Deck than to the Willow deck. When I arrived last year I noted that this viewing window, one that has been in existence for probably two decades, was overgrown. There was no line of sight to the birds. I asked that the window be cleared. I was told that the young willows were habitat for the New Mexico Meadow Jumping Mouse and that the state had forbidden the refuge management team from altering the habitat in any way. On my first drive around two weeks ago I was stunned to see that the willows lining the banks had been razed, slashed right down to ground level. Really? Who is minding the store? Just whom are we supposed to trust or believe? On a positive note, two large stands of willow and salt cedar that obstructed views of the eastern horizon as viewed from well north of the Flight Deck were removed at my request. Thanks to Assistant Refuge Manager Aaron Mize for getting that work done. It has relieved over-crowding on the Flight Deck to some degree. 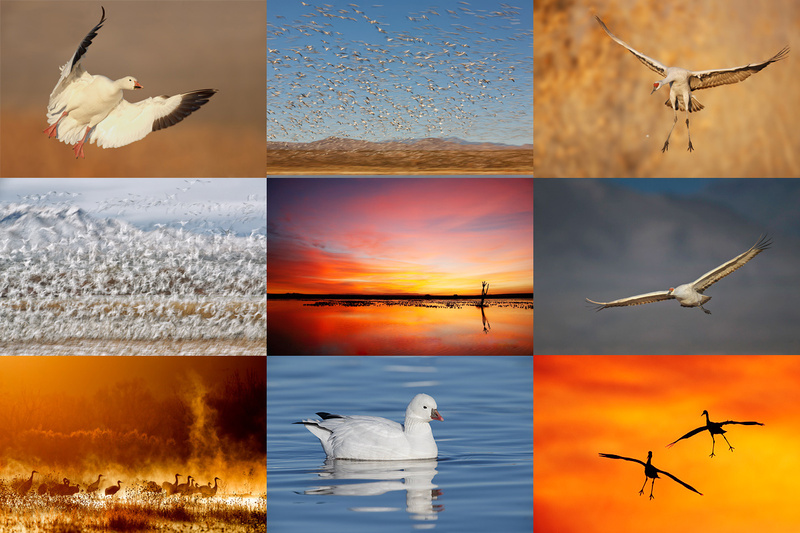 This image was created at 9:18m on the mostly clear morning of Sunday, NOV 30, 2015 at Bosque del Apache NWR. I used the Gitzo 3532 LS carbon fiber tripod), the Mongoose M3.6 head, Canon EF 600mm f/4L IS II USM lens and the Canon EOS 7D Mark II. ISO 400. Evaluative metering at zero off the blue sky 30 degrees up from the horizon: 1/3200 sec. at f/7.1 in Manual mode. AWB. This is the equivalent of our ISO 400 bright white/bright sun exposure: 1/2500 sec. at f/8. As I typed the paragraph above–thank you Denise for driving so much on this trip, I spotted some geese landing on the road well ahead. Bingo! Within minutes we had the whole group in position with hundreds of geese landing right at us into the wind that shifted from southeast to south to northeast. Just when you least expect it, Bosque will knock your socks off with great photographic opportunities. For the 89th time :), my plan is to work on a 7D Mark II User’s Guide on the long sailing legs of my upcoming Southern Oceans trip and to have make it available a few days after I get back home (on January 12, 2015). Just for the record books, I set Custom AF case 3 exactly as described in the 1D X and 5D III User’s Guides. Probably my ignorance, but I did not see a link to the “A Free Bosque Site Guide Update for All” anywhere in today’s blog. Sorry to be a pain, but I found another typo and you asked that we tell you. The Bosque del Apache 2015 trip says that the balance of payment is due by “7/25/2014 [last July]” Should that be due by “7/25/2015” [next July]? Many tanks. Fixed in both places. I’m still seeing it also. 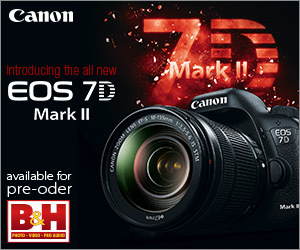 Is the code for the ad coming from B&H or the blog? can do about it except to let B&H know. I also see it on #365. Sorry I missed the 1 year mark; my spam filter didn’t like something in the email (can’t figure out exactly what) with the link so didn’t see it until this morning. You are a great teacher, and inspiration and model for all of us mere mortals, and, although we may not say it often enough, thank you! 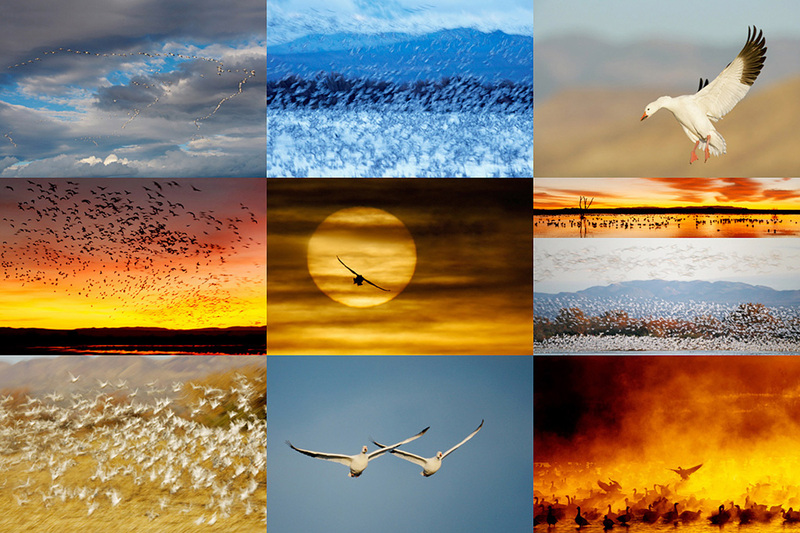 Wow, the snow goose shot above is terrific! Is your caption correct? 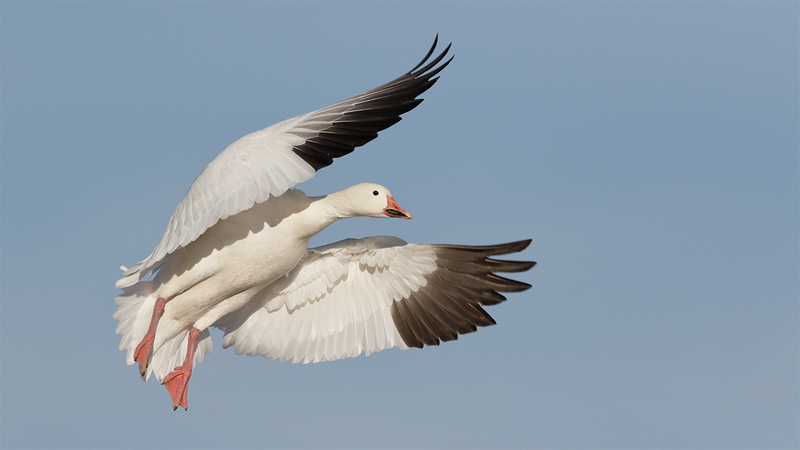 It reads “Adult Snow Goose landing with wings swept back”. Shouldn’t it read “Adult Snow Goose landing with wings swept forward”? And thank you, Artie, for all the years of generously sharing your vast knowledge of photography, including this wonderful blog! Artie, Congratulations on your year-long spree. Your posts are great and I appreciate all of the info and a chance to see your latest work. Now that you have done a full year, feel free to take an occasional day off for sanity purposes, we’ll still love you. Thanks for a great year of blog! Its been educational and fun to hear your adventures. Hard to believe you can get these done so late into the night and still be out at the Bosque before sunrise.